Welcome! This is Not Your Usual Fan Site in some ways. In others, it's embarrassingly normal. 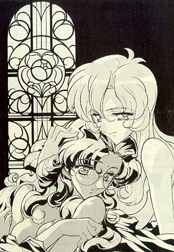 We love Utena, and our intent is to celebrate, particularly, the female characters of Shoujo Kakumei Utena. What's New? : Most recent update 8.18.2010!